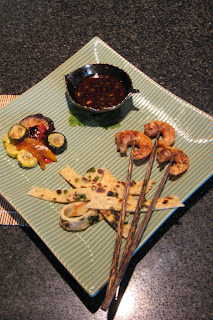 I'm happy to share the Scallion pancake recipe I created, because it requires no special ingredients (kind of - see *** below) and are surprisingly easy to make With a simple dipping sauce, it might make a good addition to a Super Bowl party or for the next time you want an interesting appetizer. Let's start with the dipping sauce. The one I made for the audition is a complex blend of peppers in multiple forms, and requires some exotic specialty ingredients only available in Asian markets or made at home. That's not the kind of recipe I'm sharing in this newsletter, so here's a version you can make out of ingredients you can find anywhere. It also is good for dumplings or spoon a little over white rice. 1 tablespoon rice wine vinegar (not the seasoned type). Whisk eggs, then add water and sesame oil, then whisk again and add to the dry ingredients, whisking until the batter is smooth. Add the scallions and stir. Heat 1/2 teaspoon oil in a non-stick skillet over medium-high heat. Dip a 1/2 cup measuring cup into the batter, filling it not quite all the way. Pout the batter into the skillet, holding the cup about 8 inches above the pan (to create a more uniform pancake. Cook pancake about 2 minutes. Bottom side should be golden, but not dark brown, except in a few small spots, if desired. Flip pancake and cook for 1 minute. Drain on a plate lined with a paper towel. If you see any oil visible on the top surface, blot it off with another paper towel. Make additional pancakes in same manner. Cut pancakes into strips, approximately 3/4 inch. Toss pancake ribbons on a serving plate, accompanied by the dipping sauce. The food judge appeared in front of me. She was an attractive Asian woman named Kim, about 30 years old. She was quite comfortable to talk to, despite the nerves I could feel running through me. She asked what I cooked, and quickly said she'd not be tasting any more shrimp. She'd already had enough for the day. I mentioned that if she knew the wonderfully numbing taste of Sichuan peppercorns, she'd understand the shrimp easily. Thankfully she was familiar with the magical peppers. The highlight of my dish was the dipping sauce, which is what I wanted her to focus on. I mentioned that it was made in an authentic Sichuan manner, building up multiple types of pepper and spices to create a unique overall taste. I had five kinds of pepper in my sauce: red Sichuan peppercorn infused oil, Sichuan chili black bean paste, a pinch of dried roasted red peppers, a pinch of ground roasted Sichuan peppercorns and a tiny dash of white pepper. While this sound incredibly spicy, it actually is not. She dipped her fork into the sauce and tasted. She complimented me on it (good sign) and asked what I used to balance against the spicy flavors. It was ShaoXing Rice wine, which tastes a lot like dry Spanish sherry. There's also soy sauce and a dash of sesame oil. The only other ingredients were finely diced ginger and a smattering of scallion slices. Kim asked if I had used Chinese 5-spice powder - she thought she could taste it. But I had not. All those flavors built up on their own to create a wonderfully complex mix that causes your mouth to tingle slightly, the characteristic of Sichuan peppercorns. The next component on my plate were scallion pancakes. I told Kim that they were a common street food, which I thought would match this dish well. I had cut the pancakes into wide ribbons so they could be picked up individually and dipped in the spicy sauce. She ate a half inch portion off the end of one. Of course she did - how could anyone taste so much food in a day? I also mentioned that I had never made several of the components of my dish before, including the pancakes. She complimented my on my bravery to cook something new for the audition. Yet that's indicative of how I cook. I certainly wasn't going to bring a signature dish, because I don't have any. As I composed this dish, I knew that the pancakes were a good component to contrast the shrimp and to use the sauce. Plus, I fried up some store-bought scallion pancakes as a backup, just in case. Kim tasted my marinated vegetables, choosing a small zucchini, I'm guessing mostly because it was small. She complimented me on the vegetable, and now that I think about it, the pancake too. I was definitely feeling good, because I didn't hear that praise when she tasted the speckled trout dish next to me. She asked what lead me to choose this dish. I indicated that I figured there wouldn't be too many Chinese dishes at an audition in New Orleans, that I loved these flavors, and that I learned about them as a result of travelling to Sichuan to adopt my youngest daughter. Kim moved on, and a while later - a nerve-wracking while later - a producer came over. We quickly established that she was the person who had called me the night before to confirm that I was coming to the audition. How cool - I wanted to meet the person I talked to. Serendipity? I sure hope there's plenty more in this process. She asked my why I wanted to be on Master Chef. I told her that I've loved food and cooking all my life, have dreamed of it being my career, but never have had the nerve to open a restaurant due to my lack of actual restaurant experience. She tasted a shrimp and a pancake strip and liked each! She seemed ready to go, but I wanted to sell myself one step further. So I repeated to her that this was not a specialty dish, and that I had never made the scallion pancakes or this exact version of the vegetables before. She didn't seem too impressed and I could tell she wanted to move on. But to my relief, before she left, she leaned in closer to me and quietly said, "After you pack up your dish, please go see the girl in the blue shirt across the room". While I didn't immediately assume it meant I'd passed, I knew it had to be good. When I got to meet the blue-shirt girl, I was truly nervous - this had to be very good. The first thing she said to me after finding my application was, "Congratulations - the judges liked your food.". Wow!! I had made to the next stage. She and I determined a time slot for an on-camera interview. Though I focused on remembering her name when she introduced herself, I had become so excited after getting the news that I forgot it. Nor can I remember it now. So I've forgotten the name of one of the most important people in the process. Nice. Well, I'd bet most of the people who got their "green tickets" were in the same state I was. That's where this story pauses. My interview is tomorrow in New Orleans. I'll be sure to share what happens next. And because for the next day or so I'll be in "another place" - in many respects - I'm dashing off this story in place of the traditional weekly newsletter. I hope you enjoy the substitution. The audition for Master Chef required that each contestant present a single plate to the judges, served at room temperature. We'd have 5 minutes to plate our dish, but no ability to cook or warm the dish. I chose to compose a dish in which three of the four components were supposed to be served at room temperature; in fact, were better at the temperature. All I had to do was transport a small jar of cooked shrimp and keep it chilled in the hotel refrigerator overnight. When I got to the audition site, I found a line of 50-75 people bearing all manner of coolers, warmers, boxes and even grocery bags. I settled into the back of the line and eventually struck up pleasant conversations with my fellow cooks. We were all nervous, and it was apparent that everyone loved cooking immensely. But we clearly had different levels of experience and approaches. One fellow contestant was an attractive Hungarian-born girl, Nikoletta, who seemed as well prepared as I was. She was toting a portable refrigerated cooler like the one I used to transport my chilled shrimp safely from Houston to New Orleans. Another was a middle aged character in a tan suit, with brown and white saddle shoes and a snappy fedora. Mardi Gras beads hung around his neck. I wrote him off as an attention seeker and doubted he'd present a decent dish. After about an hour and a half wait I entered a courtyard to submit my application, photos of myself and of my dish. TV cameras and boom microphones began to show up sporadically. The crew took a few shots of some applicants and returned to the audition area. They briskly hustled back when a (very) buxom brunette in a tight sweater, tight black pants and stiletto heels arrived at the application desk. No surprise there. 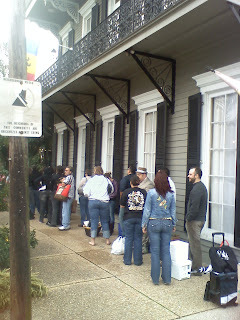 I was issued number NOLA-64 and then waited anxiously for the next spots in the judging area to open up. When my number was called I entered a room containing seven folding tables covered with white table cloths. Three contestants were situated at each. Food judges and production staff were engaging with the participants in a somewhat unhurried manner. That made me feel good - they weren't rushing through this thing. I had expected that at a New Orleans audition there would be a plethora of etouffee's, pan fried fish, maybe some gumbo or dirty rice and an overdose of shrimp and crawfish. With a quick glance around the room, it turned out to be an accurate guess. The fellow set up next to me had a crusted speckled trout atop "creole spaghetti". His presentation was excellent, as he used a squeeze bottle to fill, then overflow cherry tomatoes with a remoulade. It looked like a great dish, but it also looked very much like many other dishes I could spy around the room. I wrapped up my plating, hands not too steady, but not truly shaking either. I saw the camera lights go on. They were interviewing Nikoletta. She was clearly quite nervous when speaking. The producer even asked if she was nervous and why. I couldn't hear her answer, but did I notice that her dish was beautifully arranged, with steam rising above it. Ahh....she had used the heating function, not the cooling function on that portable device. The camera next went onto Fedora guy. Not a surprise, really. But what was a surprise was his dish. He had four shrimp, skewered dramatically lengthwise, balancing atop a half ear of corn on the cob. The plate was filled with a traditional "mache choux", a Cajun corn and vegetable stew. He too was asked if he was nervous, which he was. He also stated that the dish was his "go-to dish" for entertaining. That's just what I wanted to hear - that this dish might be the best he's got, and it was simply a good version of a local dish. I think the contestants are going to need much stronger "chops" in the kitchen, and not be quite that nervous with a camera on them. Producer: So why do you want to be on Master Chef? Producer: Well, I'm 45 years old too, so I guess I should be on the show. 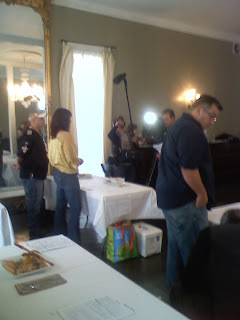 This Saturday I went to New Orleans to audition for a reality TV cooking show. It's currently titled Master Chef (but that could change before it airs). The star is Gordon Ramsey and it should be shown on Fox this summer. The idea of the show is that you have to be a rank amateur. No experience in a profession kitchen. They ask if you have culinary school experience, but I'm not sure if that disqualifies you or not. When I arrived in N.O. the night before the audition I still had to finish a few questions on the 12-page application. 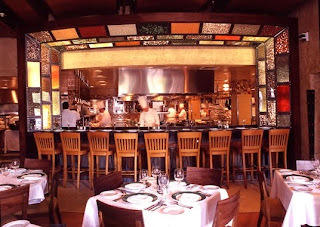 So I dropped into Emeril's original restaurant in the Warehouse District for a glass of wine and an appetizer, the application in hand. I also knew there was a food bar - seating that overlooks the open kitchen - and since I was alone it would be great fun to watch the kitchen team in action. When I started my cooking newsletter, I mentioned that I've never been in a professional kitchen. Sitting in this spot, I was closer than I had ever been, and got to see every station at work. You're so close to the grill station that you get pretty warm sitting there. Once things calmed down toward that end of a night I could chat with the staff, including the grillman, Killer. I think his real name is Jason or Jeremy, but he said there were three of them there with the same name, so he's Killer. I had ordered an appetizer of baby octopus served over creamy polenta. I'll tell you, people knock Emeril for being so commercialized, but this dish was awesome. With a glass of "The Prisoner", a great red blend from California, I was settling in comfortably. What is your cooking philosophy or point of view? Constant variety in the kitchen - new recipes and ingredients; always looking for highest quality ingredients and techniques that let multiple flavors come through. Who influenced your cooking the most. Why? Pierre Franey - he took traditional French cooking techniques and applied them to home cooking in an effective manner - retaining those multiple layers or flavor. His 60 Minute Gourmet column was an important part of courting my wife. It was a blast, and I gained insight by having to expressly state my views on cooking in that manner. I was excited and couldn't wait to let the judges get a taste of my dish the next day. Use a small number of high quality sources to obtain recipes. Randomly buying cookbooks, or downloading recipes can lead to frustration and average results. Challenge yourself to cook new recipes and use new ingredients. Break out of weekly / monthly routines as best you can. Find high quality ingredients. Learn which stores around you carry the best produce, meats, seafood. Learn how to pick out the freshest and highest quality items among the ones offered. Commit to yourself to improve your cooking techniques - from prepping ingredients, to stovetop skills, to oven and baking techniques. You won't improve unless you try to improve. The goal of my newsletters and website is to provide information to you in all the areas I just mentioned, so you can become a better cook. Add tomatoes and juice from the can. Bring to a boil, then reduce to simmer for 30 minutes. The sauce will thicken. Add a touch of salt at the end. The sauce can be kept in the refrigerator for a week, and freezer for up to 6 months. We spent the Christmas holidays in Chicago, where I frequently got to cook for our extended family. A few meals centered around recipes I've already shared with you in this newsletter: Leek and Sausage Soup and White Chili were both big hits. What was most exciting for me was having access to the numerous Italian delis that can be found in near any Chicago suburb, let alone the mecca of Italian food shopping - Harlem Avenue near Elmwood Park. When I lived in Oak Park and was getting deeper into cooking, I would frequent the delis and small grocery stores nearby in a predominantly Italian American area in far west Chicago. I'd be one of the only English speakers there, and frankly was a little intimidated by the Italian speaking grandmas and housewives I was rubbing shoulders with. There I learned the subtleties of different grades of prosciutto, sweet gorgonzola, home made ricotta, a small army of cured sausages, as well as fresh store-made sausages. Dried goods were imported from Italy, most importantly San Marzano tomatoes and semolina pastas. Today you can find good pasta in any supermarket, and usually some San Marzano tomatoes, but in the 1980's that was certainly not the case. Caputo's was one of the larger markets, and I see now they've expanded to multiple locations around Chicago. My favorite was a hole in the wall on North Avenue, where I befriended the owner and his wife. Sadly, their little store, along with most of the smaller delis, was lost to changing times about 10 years ago. There are so many Italians and avid cooks in Chicago that you're never more than one suburb away from a reasonably stocked Italian deli. At Amici's Italian Deli in Westmont I found a small selection of fresh produce, very well priced, and a large selection of pastas, tomatoes, olive oils and the deli counter. Highlights in the deli were three variations of fresh sausage, top grade prosciutto and imported gorgonzola. They had imported brands of dried pasta (called...... in Italian) with shapes you never find in a regular supermarket. So while I got to benefit from these great products while in Chicago, how does one survive without an Italian deli if you live in, say, Houston? As best I can tell, there are literally no Italian groceries here, and the few places that call themselves delis are really sandwich shops that sell a few dry goods. Far from a deli if you ask me. There are surprisingly few good online resources for these products, and shipping and refrigeration costs make that option quite expensive. So my approach in our Italo-ethnic-averse metroplex is to find the best available products and stock up. It takes time, trial and error to seek out the best brands, and stocking up can't be done for fresh ingredients like soft cheeses. If you live far from the real thing, I hope to save you some trouble by sharing the best of the widely distributed brands. San Marzano Tomatoes are a little hard to find in a regular grocery, but always available at high end markets like Whole Foods and Central Market. When I get a good price, I buy in pretty large quantities. They also travel well, so I stock up in Chicago or order online. La Valle brand is good, and so is Cento, which is widely distributed. 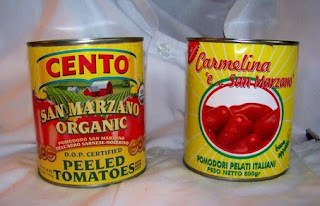 The brand called San Marzano are actualy NOT authentic San Marzano tomatoes - it's just the brand name. But they are not bad, and a little less expensive than the real thing. I try to avoid Delallo brand. Find an Italian Sausage that you can rely on. This is hard to do, but once I find a decent sausage, it becomes my go-to product. The Syracuse brand is nationally distributed and is OK but not great. Specialty foods shops may carry a good brand, with a price tag to match. An upstate New York producer is available frozen at Spec's in Houston, so that's my source. Frozen is horrible to consider compared to fresh, but at least the flavors are what I've come to expect. Use only semolina pastas. Barilla brand is reliable, inexpensive and ready available. DeCecco is widely available, at double the price of Barilla, with little discernible difference. Test a high end dried pasta once in a while - the ones that cost $5 a pound or so. They tend to be worth the price, but not worth the investement for everyday dining. Reasonable quality dried sausages find their way into some groceries, and most grocers carry good brands, like Columbus. As you experiment you'll find brands that are too soft, fatty or lack flavor. Trial and error is important in this category. Find a good Parmesan. It should have a slightly chalky mouth texture, and a strong nutty flavor. Most store brands and the national brands like Belgioso are bland. Primo Taglio from the Safeway chain is surprisingly good. Here's where a trip to a specialty shop or a high end grocer is worth the trip and the premium price tag. Good quality tomatoes - San Marzano of course. In upcoming issues of this newsletter I'll share details on the ethnic markets I go to in Houston (where I'm the only English speaker) and a discussion of the "secrets of success" for recipes. It seems too simple to write anything about how to cook pasta. Everyone can do it, right? Well, I've got a couple tips that you might find useful. I'm focusing only on manufactured dried pasta. We can consider fresh pasta a little further down the road. To start - the brand and type of pasta you choose to cook is more important than ANYTHING else I have to say about pasta. You want a good quality semolina pasta. I think Barilla is the least expensive, good quality pasta out there, with major brands like DeCecco widely availble at a slightly higher price. Some of the super high end pasta's, such as Rao's (pronounced ray-o's, made by a near century old New York family restaurant) are worth a splurge from time to time. You'll often find them to be thicker, richer in taste and be available in uncomon shapes. 1. How much water to cook pasta in? Frankly, as long as the pasta is well covered, it won't matter if you don't have gallons and gallons of water to cook it in. Filling an 8 qt stock pot to three-quarters full will alwys be sufficient for a pount to a pound and a half of pasta. Some sources recommend much more, but it will just take that much longer, and more energy, to get the water to a boil. 2. Adding Salt vs. Oil. This is a practice that is frequently debated, with some even saying not to add anything. I prefer a small drizzle of oil, since it will coat the pasta slightly after cooking, and a little salt will help bring out flavor. But frankly, I think these are minor embellishments. 3. Pasta Cooking Time. 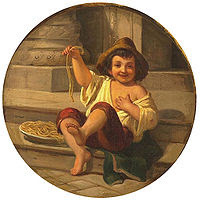 When manufacturers added suggested cooking times to pasta packages it was a great help in many kitchens. The issue is that both products and kitchens vary greatly. If you use the same brand of pasta repeatedly, you'll learn whether the cooking time on the package is spot on, or too much or little. Whenever I cook a brand I've never used before (or use infrequently) I set my timer for about 3 minutes before the recommended time, and check from then on. One decent manufacturer (Central Market in Texas) has so mis-judged their stated cooking time that even 3 minutes early resulted in overcooked pasta. But once you know that about their product, you can be prepared next time. One last thing - if you need to make a few batches of pasta at once, use the same water multiple times, retreiving the pasta with a strainer. You'll get a rich soupy pasta water that is a great thickener for sauces. One of the nicest things about Italian cooking is that a GREAT tomato sauce is always within reach. You may be surprised to learn that many high end Italian restaurants use canned tomatoes to make sauce. Think about it - the tomato season is not long, tomatoes are somewhat expensive to ship without damage, and in a suace, the tomato is cooked down anyway. Which brings us to the QUALITY of a tomato. The San Marzano tomato is considered the best cooking tomato available. This variety has been grown since the middle ages, and has firm flesh, few seeds and a delicate skin. To this day, they are still harvested by hand, which is part of what drives their cost up. I've been buying San Marzano tomatoes for 25 years, and can attest to the marked contrast between supermarket brands and the real deal from Italy. There are slight variations among brands, but any real San Marzano should have a great taste. 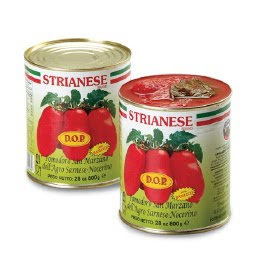 Authentic San Marzano's will be labelled D.O.P. (Denominazione d' Origine Protetta), indication of their registered status by the EU. In order of preference, here's how I rank canned tomatoes. They will be labelled "whole plum tomatoes" or "peeled plum tomotoes" or "pomodoro pelati" and may often contain a leaf or two of basil. Crushed tomatoes are also useful for some dishes. Chopped, diced, strained, and otherwise mutilated tomatos are, in my mind, well, mutilated. To make things confusing, one commonly distributed brand is called San Marzano. But that's just the brand name, they are not actually San Marzano tomatos. They are plum tomatos, and they are imported from Italy, but they're not quite as good as the real thing. 1. Lay the pork out flat and sprinkle with S&P. Let rest at room temp during next steps. 2. Heat about ¼ cup olive oil in a large skillet over medium high heat. Add onion and fennel slices and cook until brown and slightly carmelized, about 10 minutes. 3. Add the pork, fennel seeds, 1 tablespoons of ground black pepper, the rosemary and garlic and cook for 10 minutes. Let cool. 5. Add a tablespoon or so of fennel fronds to the sausage mixture along with the breadcrumbs and eggs. 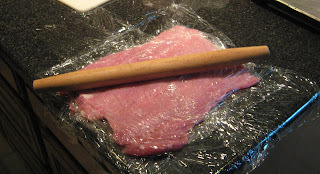 Stir to combine, then spread over the pork, leaving a 1 to 1-1/2 inch edge along one long side. 6. Roll the meat up jelly roll fashion and tie with butcher’s twine. 7. Place the red onions in a roasting pan, and place the pork atop the onions. Roast for 1 hour 15 minutes, or until internal temperature is 135 degrees. Let rest for 10 minutes. 8. Add olive oil and a squeeze of lemon to top of roast, then slice. Serve with the carmelized red onions. One was the best of roasts, the other the worst of roasts. You can thank me now for stopping after one sentence. I’ll proceed. Sherry P. from Kingwood, Texas asked me if I had a good recipe for pork roast. She said her roasts were often dried out and wanted something better. I’ve made a few pork roasts in my day, and usually followed two approaches. I recall using just salt, pepper, garlic and rosemary on a small roast. The smell from this roast is to die for but indeed it gets pretty dried out. And this simplistic approach would just kill a larger roast. What I do most often is a crown roast, stuffed with rice, vegetables, dried fruits or all of the above. The crown roast is the one you see tied into a huge ring, with the bones jutting dramatically above the meat. The “little hats” often decorating the bones are called frills, from which the phrase “no frills” is derived. It’s a great presentation for a holiday meal or party, but probably not what Sherry is looking for. Instead of using my small library of reliable recipe sources at home (read more here…..) I went online for a recipe. I almost always use www.epicurious.com and pretty much only use recipes from Gourmet magazine. I found…. This sounded awesome to me and many online readers gave it 4 stars. Mortadella is an Italian bologna-style meat studded with pistachio nuts, and is easily found in any grocery store deli. A little bottle of truffle oil for flavor, and we’d tie up the roast. Very few ingredients, so this would let me cook up some side dishes while the roast filled the kitchen with great flavors. Could it be that simple? ‘Fraid not. There are two steps to stuffing a pork roast. The good news, is you can handle them pretty easily after just one or two tries. See my web site for detailed instructions. The first is to butterfly and pound out the pork roast. If you ask the meat counter to do this for you, they’ll almost surely do it for free. The second is tying the roast. Tying roasts may sound intimidating, but it is WAY easier than it first appears. When I purchased a small bottle of truffle oil, I was surprised at how inexpensive it was. This was a red flag, but one I ignored. As I splashed a little onto my neatly butterflied and pounded roast, and the most awful smell emanated. I quickly wiped it away and followed up with olive oil. That’s only the story of a poor quality oil, not a poor recipe. Yet in the end we were underwhelmed by the salvaged recipe as well. The mortadella seemed more like a sandwich filling than a savory stuffing. The pork – still a bit dried out. No stars from me – I won’t make it again. This weekend we decided to roast something during our frigid cold spell. I found a huge boneless pork roast, but what to stuff it with? Certainly not Mortadella. Mario Batali came to the rescue again. In Molto Italiano he offers a home version of a recipe for a whole roast suckling pig –using our friend the pork roast. In his recipe, you cook onion and fennel until they are sweet and carmelized, add ground pork and spices – which results in homemade sausage (imagine bragging a bit about that at your next dinner party). To the sausage add some breadcrumbs and egg for a delicious savory filling for the pork. Besides creating a very flavorful filling, Mario directs us to place the roast into a roasting pan atop 3-4 halved red onions, instead of on a rack (such as a v-rack). This not only elevates the roast above its drippings, but results in some of the sweetest carmelized onions you can imagine. They were delicious with the pork. Don’t trust online ratings….the 4 stars in the bad recipe were based on people adding all manner of things to the recipe to fix it. The recipe itself was flawed. Be cautious with online recipe sources. Just because someone published a recipe doesn’t mean it’s really that good. Develop a small library of high reliable recipe sources. Besides my columns and website, I recommend Cooks Illustrated magazine, Molto Italiano, and How to Cook Everything. You could become a great cook just from using these three resources alone. “It was a far, far better recipe that I made, than I have ever done; it was a far, far better roast than I have ever known.” – Charles Dickens, after a terrific pork dinner. The string needs to be coated to withstand moisture and heat. It's hard to find good butcher's twine at local stores, and you shouldn't overpay at a specialty store. Try online, such as the one recommended on my web site. As for roasting pans, they are not all created equal. This is something to make an investment in for sure. I bought and off-brand that Williams Sonoma put their own name on, and I regret it, as it eventually warped. Wrong way to save a few bucks, because now I have to replace it. See my recommended roasting pans on the website. Tying a roast is WAY simpler than it might first appear. Even if you end up with a roast that looks like a bank robbery hostage, your roast will still be uniform shape and cook more evenly. But we can improve on that. Here’s how. 1. Cut a piece of butcher’s string about 4 feet long. 2. Place your roast end to end, pointing away from you. 3. Wrap one end of the string around the far end of the roast, about 1 to 1-1/2 inches from the end. Pull the string firmly around the roast and tie a knot. You now have a loop knotted onto the roast and about 3-1/2 feet of loose string. 4. At about 6 inches above the knot, hold the string in your left hand. With your right hand, hold the string about a foot further out. Move your left hand to the left side of the roast. Place your right hand at 12 o’clock at the far end of the roast. 5. Now slide the string under the roast using your right hand. Keep sliding it under the roast until both your left and right hands are about 1 to 1-1/2 inches closer to you than the loop you tied. 6. Bring your right and left hands together above the center of the roast. With your right hand, run the string under the string in your left hand, and pull it tightly. You have just formed a new loop, parallel to your first one. 7. Repeat this process, until you reach 1 to 1-1/2 inches from the near side of the roast. At that point just tie the string in each hand into a knot. You’re done. All you need for this is a sharp knife. Think of this as a reverse jellyroll. 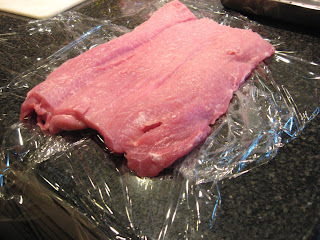 You’re starting with a rolled up roast, then are going to cut it into a 1” thick sheet. Imagine the spiral of a jelly roll, that’s what you’ll be cutting. 1. Place your roast end to end, pointing away from you. 2. Make a slit down the center of the roast, about 1” deep. 3. Slide your knife into the slit you just cut. Then turn your knife so it’s almost parallel to your work surface. 4. Begin to gently saw sideways, to create a 1” think flap of meat. At first, only cut about a 1” flap, then keep cutting deeper and deeper, to open up the meat like a book. 5. Keep cutting this flap deeper and deeper, trying to keep an even thickness. That’s it. If you recipe calls for pounding the roast to an even flatter thickness, cover the meat with a double thickness of plastic wrap, and pound it with a mallet, rolling pin or small pan. Fennel could be considered a secret ingredient for a good cook. Not long ago it was just one of those vegetables in the produce section that most people passed by because they didn't know what it was. Thankfully it's getting more popular, so fennel can be easily found in almost any grocery store, and the price is somewhat reasonable. OK - it's not reasonable, but maybe it's close to fair - about $2-3 for a large bulb / stalk - considering how wonderful an ingredient it is. Why is fennel so useful? Because it can be used as an aromatic like onion to add another complementary flavor into a dish, but it can also stand alone as a raw or cooked vegetable. How to use it? Well, in many sauces or vegetable dishes that call for chopped onion, you can substitute one-third or more of the onion then chopped fennel. My favorite way is to just cook half fennel, half onion in olive oil over medium-high heat for 15-20 minutes until they are sweet and brown. Add some S&P, a shake of dried red pepper flakes and a sprinkling of fennel seed part way through. This makes a delicious topping for homemade pizzas, burgers, or even placed atop a peppery water cracker as an appetizer. Cutting fennel is easy. Chop off the very end of the bulb. Then cut the bulb/frond right where the white part turns to green. Cut the bulb in half lengthwise, then slice the halves thinly. You can chop the fronds, which look like fresh dill, but are not, and use them as you would use fresh dill. The green "celery-like" parts are good to throw into a stock, but generally aren't too good eaten alone. OK – we’re making chili. The word saute shouldn’t apply, and it hardly does. However, if you’ve got a few minutes, you can learn a lot about sautéing while making this chili dish. When meats are sautéed they need a little breathing room to brown well. If the pieces are touching each other they end up steaming or braising in the juices released by their neighbors and won’t reach a crispy brown state. When making the chili, add just a handful of the turkey pieces to start, spread them around the bottom of the pan and give them some room. You’ll see that they work up a little brown char after about 3-4 minutes. If you went heavy on the onions, you might need to remove a few to see this clearly. Next, add all the remaining pieces. The full pound or more of turkey will cook through, but only a few pieces of the new batch will get browned. Again, this browning isn’t too important for the chili dish, but next time you’re sautéing or browning anything in a pan – meatballs, chicken pieces, shrimp, chops – give them some room and they’ll brown up better. Picture: Onions for homemade french onion dip, nicely browned, having been given a little space. Barley is a cereal grain and a member of the grass family, In the kitchen it is used primarily in soups and stews, especially in Scottish and African dishes. 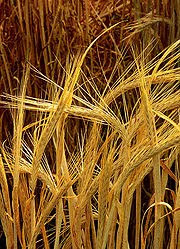 Barley is also used in beer making and is a major animal feed. Barley has a unique history in that it is the first domesticated grain, with evidence of it’s existence dating back to 17,000 BC, at one point being important enough to be used as currency. Fermented barely drinks were common from ancient Egyptian and Greek times up through the middles ages. Barley may be considered too bland to be eaten alone. However, cooked in a good chicken stock with onions or leeks combined with other vegetables can make a decent side dish. It creates an excellent texture in the White Turkey Chili with Garbanzo Beans. Barley can be hard to find in the grocery store, because it’s stocked in different places depending on the store. Ask the staff for help finding it, because it is almost certainly in the store somewhere.